Tech managers, integrators, and AV pros: whether you will be joining the show in Orlando or following the show virtually, our in-depth coverage will keep you connected. Live @ InfoComm 2015by NewBay Media, sponsored by Christie, is your go-to resource for all things pro AV before, during, and after the show floor heats up. Have a hankering for pre-show product predictions and must-see booths collected in one spot? How about a simple way to stay in the loop while you're racing from classes to demos and booths in the Orlando Convention Center? Or maybe you want one central hub where you will find your favorite bloggers, product reviewers, and #AVTweeps? We've got all those bases covered (and then some). 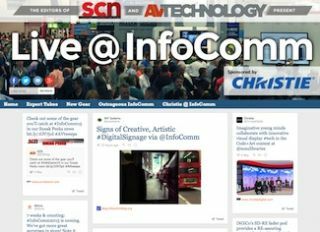 Live @ InfoComm 2015 is a dynamic social media aggregation page of all things InfoComm, curated by the editors of Systems Contractor News, AV Technology, and AVNetwork. The most relevant and trending content will be organized in a visually engaging and highly social environment. Live @ InfoComm 2015 will be actively managed throughout May and the month of June, providing the most up-to-date source of what’s trending throughout InfoComm and post-show. Check it out at www.avnetwork.com/infocomm2015.